There is currently no effective clinical treatment for diastolic heart failure also termed heart failure with preserved ejection fraction (HFpEF) which is associated with reduced myocardial adenosine triphosphate. Ubiquinol in the electron chain is required for adenosine triphosphate synthesis. Thus, the purpose of this pilot study was to examine in a rat model the effects of ubiquinol (reduced form of Coenzyme Q10) in the development of HFpEF. Six Dahl salt-sensitive rats were randomly assigned to either control or experimental groups. Starting at the age of 7 weeks, all rats were fed 8% NaCl diet and water for 12 weeks. The rats in the experimental group were fed ubiquinol (2 mg/100 g) in the water. Blood pressures, heart rate, and echocardiographic data were obtained at baseline and at the end of experiment. Rats in the ubiquinol group had lower increases in blood pressures and left ventricular wall thickness. Heart rate variability was not significantly different although there was a decrease in heart rate and an increase in parasympathetic nervous system output in the ubiquinol group. There was also less cardiac mitochondrial damage in the ubiquinol group compared to the control rats. Though the sample size is small, the supplementation of ubiquinol appears to reduce blood pressure and myocardial mitochondrial injury. Heart failure is a progressive deteriorating disease and the leading cause of morbidity and mortality in the U.S. The prevalence of heart failure is gradually increasing and it is estimated that there will be 8.0 million US adults who have heart failure by 2030 . More than 50% of heart failure patients have preserved ejection fraction (HFpEF) in which impaired cardiac muscle relaxation and diastolic filling are the hallmarks [1,2]. Many cardiovascular abnormalities and peripheral impairments contribute to the heterogeneity of HFpEF. Currently, there are no specific treatments available for HFpEF that demonstrates effectiveness in reducing morbidity and mortality. Without suitable treatments and management, patients with HFpEF are at high risk of hospitalization and readmission resulting in significant suffering and healthcare costs . Research has shown that left ventricular diastolic dysfunction or relaxation abnormalities contribute to the development of HFpEF, when compensatory mechanisms fail. These abnormalities are associated with, and have been attributed to hypertension. Cellular energetic impairment or decreased intracellular adenosine triphosphate (ATP) production in the heart can lead to diastolic dysfunction by affecting the disassociation of myosin and actin. Subsequently, the sympathetic nervous system is over stimulated and can cause hypertension [4,5]. In addition, the capacity of the nitric oxide dependent vascular relaxation is also impaired by excessive reactive oxygen species production . Thus, finding a preventative treatment for HFpEF could significantly reduce morbidity and mortality and substantially decrease healthcare costs as well. Ubiquinol (the reduced/active form of Coenzyme Q10 is an essential component in the mitochondria that enhances cellular energetics and scavenges free radicals. In healthy young adults, the biosynthesis of ubiquinol is sufficient to meet the body needs [7,8]. However, in patients with HFpEF, mitochondrial ubiquinol is significantly reduced . This is possibly due to aging and/or advanced disease stage . To the best of our knowledge; no studies have demonstrated that ubiquinol plays a role in preventing the development of HFpEF. Therefore, the overall objective of this study was to examine the effects of ubiquinol in preventing the development of HFpEF using a Dahl salt sensitive (Dahl S) rat model. With increased incidence and prevalence of HFpEF, investigating the effects of ubiquinol in preventing and treating HFpEF could have a significant impact on public health. The pilot study will help to evaluate the feasibility and potential of ubiquinol administration on understanding the mechanisms of cellular energetics impairment in an experimental model of HFpEF. This provides insights for the treatments specifically targeted to hypertensive HFpEF. Prior approval of the Animal Care and Use Protocol (ACUP) for this study was obtained from the Institutional Animal Care and Use Committee (IACUC). All of the procedures of this study conformed to the “Guide for the Care and Use of Laboratory Animals” by the U.S. National Institutes of Health (NIH). All of the rats were closely monitored for the signs and symptoms of such as significant weight gain, little to no appetite, and labored breathing etc. Food and water were ensured to be within easy reach. Environment enrichment was reinforced. If the rats in the control group appeared to develop HFpEF and suffer significant difficulty in breathing due to heart failure before the end point of the experiment, they were euthanized to reduce the suffering. The Dahl salt-sensitive (Dahl S) rat is a genetic model of hypertension that exhibits many phenotypic characteristics in common with hypertension in humans. The Dahl S rat is a low-renin, sodium-sensitive form of hypertension that is associated with a gradual reduction in renal functions including blunted pressure-diuresis and natriuresis responses, decreased glomerular filtration rate, and increased sodium reabsorption. When fed with a high salt diet starting at 7 weeks old, the Dahl S rats showed a sharp elevation in blood pressure and progressive left ventricular hypertrophy and developed isolated HFpEF by the age of 19 weeks . This is a very useful animal model to study the mechanisms of the development of HFpEF. Six Dahl S rats were used in this pilot study and randomly assigned to either the control (n=3) or experimental (n=3) groups. The primary variables that were measured in this study included blood pressures and various cardiac function measurements. Blood pressure was obtained using a volume-pressure recording system (CODA, Kent Scientific) that was non-invasively placed onto the right leg. Cardiac function was assessed by echocardiography. In this study, we were particularly interested in measuring left ventricular diastolic function. After anesthesia by intraperitoneally administered sodium pentobarbital (50 mg/1 kg body weight), the chest hair was shaved. Electrocardiogram needle leads were connected to the limbs for electrocardiogram gating. The rat was placed on a thermostat pad to keep the body temperature around 37ºC. A rectal thermometer was inserted for monitoring the body temperature. Warmed echocardiogram gel was placed on the shaved chest. Echocardiogram was performed on a cardiovascular ultrasound system (GE Healthcare, LIGIQ 5) at baseline and 12 weeks on each rat. A 13 MHz linear transducer was used to image the heart when the rat was placed at a left-side position. Two-dimension guided left ventricular M-mode, transmitral inflow Doppler spectra, and Doppler waveforms were recorded. The results were interpreted by a cardiologist. Six Dahl S rats were purchased from Charles River Laboratories International, Inc. at the age of 5 weeks. The rats were housed and allowed to acclimate for 7 days. The six rats were randomly assigned to either the control (n=3) or experimental (n=3) group. Starting at the age of 7 weeks, all the rats were fed with laboratory chow containing 8% NaCl diet and standard water provided by laboratory animal resources (LAR). All the rats were allowed to consume food and water ad libitum throughout the experiment. In addition, the rats in the experimental group were fed ubiquinol daily during the 12 weeks of the 8% NaCl diet. At the end of experiments, immediately after euthanasia and thoracotomy was performed, a 3 mm portion of the left ventricular myocardial tissue was harvested. The harvested sample was quickly fixed using 3% glutaraldehyde solution and stored at -20°C. The experienced technical personnel processed, embedded, sectioned, and contrasted the samples. Images of cardiac mitochondria were then captured using the transmission electron microscope (TEM) at 3000X. In all rats, the same area of the left ventricle was used for the TEM myocardial tissue sample. Results (blood pressures and indexes for cardiac function) are expressed as mean ± SD. One-way ANOVA repeated measures was conducted to compare the differences in blood pressures and cardiac function between the control and experimental groups. All data analysis was performed by SPSS 20.0. Significance level is set at p<0.05. We conducted a pilot study to investigate the effects of ubiquinol on blood pressures, cardiac function, heart rate variability, and cardiac mitochondrial morphology using Dahl S rats. Rats were randomly assigned to either a control (n=3) or an ubiquinol group (n=3). The rats in both groups were fed with a high salt diet (8% NaCl) at 7 weeks old. Rats in the control group were provided with standard drinking water; while rats in the ubiquinol group were provided with drinking water containing ubiquinol. In this study, we used ubiquinol in liquid liposomal form, which is bio enhanced for improved absorption. It was not flavored and was easily dissolved in drinking water. The volume of fluid consumed by the rats was monitored and the amount of ubiquinol consumed to be approximately a dose of 10 mg per 100 g of body weight. We did not find significant differences in daily amount of drinking water consumed by rats in the control and ubiquinol groups. This indicated that the addition of ubiquinol to the drinking water did not affect the rat’s drinking activity. These preliminary data suggested a strong tendency for rats receiving ubiquinol to have lower increases in blood pressures and left ventricular wall thickness (Table 1). Even with this small sample size, the two groups were significantly different in the changes of these variables from baseline to the end of experiment (p<0.05). SBP: Systolic Blood Pressure; DBP: Diastolic Blood Pressure; MAP: Mean Arterial Pressure; LVWT: Left Ventricular Wall Thickness. Values are mean ± standard deviation. a For each rat, a change in a variable was computed by subtracting baseline variable measure from measure taken at end of experiment. b Cohen effect size comparing mean change on ubiquinol versus that without ubiquinol was computed. Table 1. Blood pressures and left ventricular wall thickness. Regarding heart rate variability (heart rate, root mean square of successive differences (RMSSD), and high-frequency (HF) Power), the two groups exhibited differences in the direction predicted by our hypothesis (Figure 1), although the differences were not statistically significant because of the small sample size. We observed a decrease in heart rate (Figure 1A) and an increase in parasympathetic nervous system output measured by RMSSD and HF Power (Figures 1B and 1C) in the ubiquinol group. 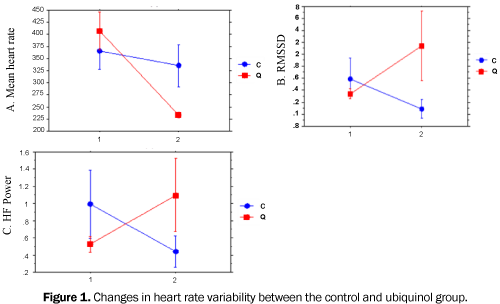 Figure 1: Changes in heart rate variability between the control and ubiquinol group. Cardiac mitochondrial morphology examined by transmission electron microscopy (TEM) showed significant differences between the control and ubiquinol treated rats (Figure 2). Substantial mitochondrial damage was observed in the control rats, including swelling, disorganized cristae, and even loss of cristae (Figure 2A). In contrast, cardiac mitochondria from the ubiquinol treated rats remained relatively intact with organized cristae (Figure 2B). Figure 2: Cardiac mitochondrial morphology by transmission electron microscopy (magnification x3000). 2A: Depicts mitochondria from a control rat illustrating swollen mitochondria with abnormal circular cristae; 2B: Represents mitochondria from a rat receiving ubiquinol and the mitochondria are less damaged with intact cristae. Our study has shown that ubiquinol in rats with heart failure have improved cardiac function and less mitochondrial damage. The data showed a significant reduction in blood pressures and left ventricular wall thickness (Table 1). Heart rate variability showed a change in heart rate variability (Figure 1). Thus, supplementing ubiquinol in patients with HFpEF could improve cardiac performance and assist with maintaining mitochondrial function (Figure 2). More than 50% of heart failure patients have HFpEF which is characterized by echocardiogram evidence of impaired relaxation and normal or near normal ejection fraction [12,13]. A critical barrier to improve health outcomes for patients with HFpEF is the lack of treatments that specifically target the underlying mechanisms of diastolic dysfunction related to cellular energetic impairment . Research has shown that cellular energetic impairment (decreased ATP production) reduces sarcoplasmic reticulum Ca2+-ATPase . This results in decreased actin-myosin cross-bridge detachment, and consequently increased diastolic stiffness with associated signs of heart failure. One cause of myocardial energy impairment is the cellular deficiency in Coenzyme Q10 [16,17]. The degree of Coenzyme Q10 deficiency correlates with the severity of heart failure symptoms which are quantified in the New York Heart Association classifications . Recent evidence suggests a role for Coenzyme Q10 as a predictor of congestive heart failure outcomes and therapeutically as an adjunctive supplement [18-22]. Of interest, both hepatic biosynthesis of Coenzyme Q10 and mitochondrial reduction of ubiquinone to ubiquinol decline with age, resulting in impaired mitochondrial ATP synthesis, and which together contribute to myocardial diastolic dysfunction [23-26]. Decreasing diastolic filling, especially when exacerbated by exertion, results in decreased left ventricular stroke volume, causing increased stimulation of the sympathetic nervous system and reduced capacity of NO-dependent vascular relaxation [6,27,28]. The composite effects then lead to elevated blood pressure. Maintaining myocardial energetics thus may decrease the severity if not reduce the incidence of HFpEF. Our pilot study data were significant because it addressed the deficiency of ubiquinol in an HFpEF animal model which has been identified as one of the underlying mechanisms in HFpEF. Ubiquinol is essential in mitochondrial electron transport and ATP synthesis. Its depletion has been shown to compromise myocardial energy generation, e.g. “energy starvation” in the myocardium . This is considered to be a pathogenic mechanism for chronic heart failure. Published work indicates that plasma Coenzyme Q10 concentration is an independent predictor of mortality in heart failure patients . A free radical is an atom or molecule that has an unpaired electron that are highly reactive with important cellular components such as DNA, mitochondria, and other cell membranes. Free radicals are a part of normal metabolism and to prevent damage the body has an antioxidant defense system [30-32]. Antioxidants are directly involved in the prevention of myocardial cellular damage by scavenging free radicals . However, in diseases such HFpEF, insufficient antioxidants and/or an overproduction of free radicals can cause myocardial injury. We have found in a previous study that there was a significant decrease in myocardial apoptosis and mitochondrial superoxide production associated with ubiquinol administration during an acute oxidative stress condition . Mitochondrial damage assessed by electron microscopy was greatly reduced with the administration of ubiquinol. There was a significant improvement in cardiac function and decreased symptoms of HFpEF in patients receiving ubiquinol. Thus, we believe it is important to nursing and all health care professionals to find a possible treatment to prevent HFpEF. The first step in investigating diastolic dysfunction and hypertension would be to conduct a large study where hypertension is untreated in both the control and ubiquinol treated groups to determine the impact of ubiquinol on the development of HFpEF. RMSSD is the normalized Root Mean Square of Successive RR Differences between adjacent N-N intervals. It is part of the time domain analysis in which N-N denotes that only “normal” heart beats originating from the sinus node are measured. Impulses from other areas of the myocardium are ectopic beats [34,35]. Thus, in Figure 1B the rats in the ubiquinol group had an increased RMSSD compared to the control group indicating increased frequency between ectopic beats. HF-power is an index of parasympathetic stimulation . In Figure 1C, the HF-power is higher in heart failure animals receiving ubiquinol indicating increased parasympathetic activation which relates to the slower heart rate and lower blood pressures with the administration of ubiquinol. These experiments provided the pilot data needed to begin investigating HFpEF. We plan to continue research on ubiquinol and its potential preventative and therapeutic effects in acute and chronic diseases. In humans, ubiquinol not exceeding 1000 mg/day  has been shown to be well within the clinically recommended range. Several studies have indicated that Coenzyme Q10 produced very few adverse effects or drug interactions [38,39]. Our current focus is on the therapeutic effects of ubiquinol in acute conditions such as hemorrhagic shock and traumatic brain injury. In the future, we have proposed a study to investigate the therapeutic effects of ubiquinol in HFpEF patients. In addition, we also intend to investigate the preventative effects of ubiquinol on HFpEF by examining the underlying mechanisms, using a rat model. Other antioxidants such as catalase or superoxide dismutase could be examined to determine if they decrease myocardial injury and reduce HFpEF . There are three limitations of this study including: 1) Small sample size. The rats are expensive and require housing for three months thus we will only use 3 rats in each group. The study may not be adequately powered with this small sample size. However, based on previous experiences, the effect size of ubiquinol was considerably large. 2) The ideal method to evaluate diastolic dysfunction is using advanced speckle tracking software, which costs around $9000. For this study, we used the software on the echocardiogram instrument that is used in most patients; it provided some of the standard measurements. 3) We were not able to control the exact dose of ubiquinol that the rats received since ubiquinol was added to their daily drinking water. However, the rats in both groups drank approximately the same amount each day so the approximate dose was 10 mg/100 mg body weight. This pilot study suggests that ubiquinol is a potential supplement that could be used to lessen cardiac mitochondrial injury in heart failure patients. Though the sample size is small, the ubiquinol appears to decrease blood pressure, reduce heart rate, and increase in parasympathetic stimulation. Future studies could address whether ubiquinol could treat hypertension and thereby attenuate cardiac hypertrophy. This study was supported by the Office of Grants and Research Jeanne Johnson Faculty Research Award at the University of Kansas, School of Nursing (OGR 114R500-30). Lloyd-Jones D, et al. Heart disease and stroke statistics--2010 update: A report from the American Heart Association. Circulation. 2010;121:e46-e215. Ross JS, et al. Recent national trends in readmission rates after heart failure hospitalization. Circ Heart Fail. 2010;3:97-103. UlHaq MA, et al. Heart failure with preserved ejection fraction: an insight into its prevalence, predictors, and implications of early detection. Rev Cardiovasc Med. 2015;16:20-27. Triposkiadis F, et al. The sympathetic nervous system in heart failure physiology, pathophysiology, and clinical implications. J Am CollCardiol. 2009;54:1747-1762. Braunwald E. Research advances in heart failure: A compendium. Circ Res. 2013;113:633-645. Postnov YV, et al. Mitochondrial energy conversion disturbance with decrease in ATP production as a source of systemic arterial hypertension. Pathophysiology. 2007;14:195-204. Knott A, et al. Topical treatment with coenzyme Q10-containing formulas improves skin's Q10 level and provides anti-oxidative effects. Biofactors. 2015;41:383-390. Onur S, et al. Determination of the coenzyme Q10 status in a large Caucasian study population. Biofactors. 2015;41:211-221. Bates A, et al. Myocardial energetics and ubiquinol in diastolic heart failure. Nurs. Health Sci. 2014;16:428-33. Lopez-Lluch G, et al. Is coenzyme Q a key factor in aging? Mech Ageing Dev. 2010;131:225-235. Doi R, et al. Development of different phenotypes of hypertensive heart failure: Systolic versus diastolic failure in Dahl salt-sensitive rats. J Hypertens. 2000;18:111-120. Chatterjee K. Pathophysiology of systolic and diastolic heart failure. Med Clin North Am. 2012;96:891-899. Liu Y, et al. Heart failure with preserved ejection fraction: Current understanding and emerging concepts. CurrOpinCardiol. 2013;28:187-196. Mcmurray JJ, et al. ESC guidelines for the diagnosis and treatment of acute and chronic heart failure 2012: The task force for the diagnosis and treatment of acute and chronic heart failure 2012 of the European Society of Cardiology. Developed in collaboration with the Heart Failure Association (HFA) of the ESC. Eur J Heart Fail. 2012;14:803-869. Kohlhaas M and Maack C. Interplay of defective excitation-contraction coupling, energy starvation, and oxidative stress in heart failure. Trends Cardiovasc Med. 2011;21:69-73. Sanchez-Lazaro IJ, et al. Autonomic nervous system dysfunction in advanced systolic heart failure. Int J Cardiol. 2011;152:83-87. Floras JS. Sympathetic nervous system activation in human heart failure: Clinical implications of an updated model. J Am CollCardiol. 2009;54:375-385. Molyneux SL, et al. Coenzyme Q10: is there a clinical role and a case for measurement? ClinBiochem Rev. 2008;29:71-82. Molyneux SL, et al. Coenzyme Q10: an independent predictor of mortality in chronic heart failure. J Am CollCardiol. 2008;52:1435-1441. Ernster L and Dallner G. Biochemical, physiological and medical aspects of ubiquinone function. BiochimBiophysActa. 1995;1271:195-204. Pacanowski MA, etaI. Plasma coenzyme Q10 predicts lipid-lowering response to high-dose atorvastatin. Journal of clinical lipidology. 2008;2:289-297. Rahman S, et al. 176th ENMC International Workshop: Diagnosis and treatment of coenzyme Q10 deficiency. Neuromuscular disorders: NMD. 2012;22:76-86. Garrido-Maraver J, et al. Clinical applications of coenzyme Q10. Front Biosci (Landmark Ed). 2014;19:619-633. Lesnefsky EJ, et al. Mitochondrial dysfunction in cardiac disease: ischemia--reperfusion, aging and heart failure. J Mol Cell Cardiol. 2001;33:1065-1089. Langsjoen PH and Langsjoen AM. The clinical use of HMG CoA-reductase inhibitors and the associated depletion of coenzyme Q10. A review of animal and human publications. Biofactors. 2003;18:101-111. Singh U, et al. Coenzyme Q10 supplementation and heart failure. Nutr Rev. 2007;65:286-293. Borlaug BA and Kass DA. Mechanisms of diastolic dysfunction in heart failure. Trends Cardiovasc Med. 2006;16:273-279. Teo SG, et al. Impact of left ventricular diastolic dysfunction on left atrial volume and function: A volumetric analysis. Eur J Echocardiogr. 2010;11:38-43. Gasiorowski A and Dutkiewicz J. Comprehensive rehabilitation in chronic heart failure. AnnAgric EnvironMed. 2013;20:606-612. Konradi J, et al. Redox-sensitive mechanisms underlying vascular dysfunction in heart failure. Free Radic Res. 2015;49:721-742. Santulli G, et al. Mitochondrial calcium overload is a key determinant in heart failure. ProcNatlAcadSci U S A. 2015;112:11389-11394. Hafstad AD, et al. Novel aspects of ROS signalling in heart failure. Basic Res Cardiol. 2013;108:359. Bennetts P, et al. Effects of ubiquinol with fluid resuscitation following haemorrhagic shock on rat lungs, diaphragm, heart and kidneys. Exp Physiol. 2014;99:1007-1015. Schuster AK, et al. Decreased heart rate variability correlates to increased cardiovascular risk. Int J Cardiol. 2016;203:728-730. Yoon Kh T, et al. Analysis of statistical methods for automatic detection of congestive heart failure and atrial fibrillation with short RR interval time series. 9th International Conference on Innovative Mobile and Internet Services in Ubiquitous Computing (IMIS). 2015. Schmidt H, et al. Relation of impaired interorgan communication and parasympathetic activity in chronic heart failure and multiple-organ dysfunction syndrome. J Crit Care. 2014;29:367-373. Hidaka T, et al. Safety assessment of coenzyme Q10 (CoQ10). Biofactors. 2008;32:199-208. Langsjoen PLA. Comparison study of plasma coenzyme Q10 levels in healthy subjects supplemented with ubiquinol versus ubiquinone. Clin Pharm in Drug Devel. 2014;3:13-7. Belcaro G, et al. Investigation of Pycnogenol(R) in combination with coenzymeQ10 in heart failure patients (NYHA II/III). Panminerva Med. 2010;52:21-25. Bowen TS, et al. Heart failure with preserved ejection fraction induces molecular, mitochondrial, histological, and functional alterations in rat respiratory and limb skeletal muscle. Eur J Heart Fail. 2015;17:263-272.